On July 12, Justice Court Judge Keith Stoney will be on the opposite end of the gavel. Stoney—or at least his attorney—is expected to explain to a Provo district-court judge his justification for throwing a woman in jail in 2010 and charging her criminally for having her cell phone out in his courtroom. Bringing the phone out twice, however, was enough for Stoney to hold an impromptu contempt-of-court hearing for Damron. A City Weekly reporter present at the hearing noticed that Stoney said recording was against court rules, though a sign posted outside of the court did not expressly prohibit recording. A sign did say cell phones weren’t allowed, but numerous people in the court openly checked their phones, including the bailiff and the city prosecutor. Stoney threw Damron in jail for 24 hours for being in contempt of court, though Damron says Stoney did not check her phone to verify whether or not two recordings had been made on the device, as alleged by the bailiff. Now, almost two years later, that contempt-of-court charge has been appealed to district court in Utah County through the filing of an extraordinary writ. The hearing may give another black eye to Utah’s justice courts, which have faced increased scrutiny from the Legislature in recent years. 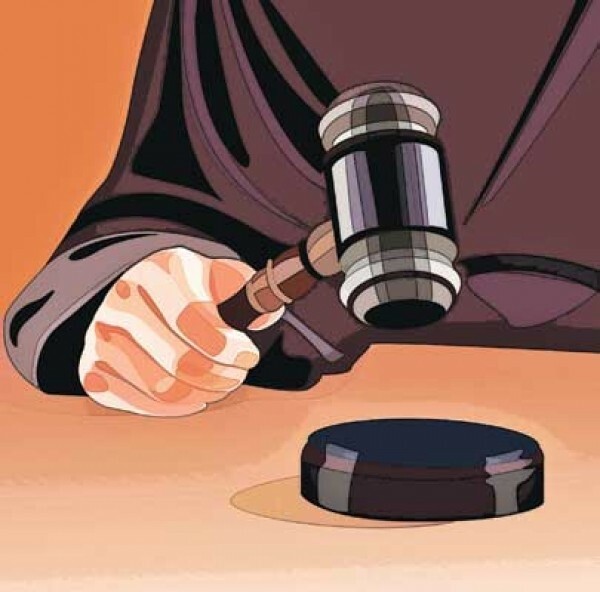 A bill passed in the 2012 session upped the standards for justice-court judges, requiring that part-time justice-court judges cannot have more than one public reprimand against them. Previously, the law required only full-time justice-court judges to have one or fewer reprimands on their records. Stoney, who serves both full time and part time as a judge in different cities, is already facing another reprimand from the Judicial Conduct Commission for allegations of abuse of his judicial power since 2011. Since 2000, Stoney has been a West Valley City Justice Court judge, and, since 2008, he has also filled a part-time judge position for the city of Saratoga Springs. His rulings have angered enough residents of the small Utah County community that Peltekian and others rallied a “No to Stoney” campaign in 2010 that sought unsuccessfully to defeat Stoney’s retention in the election that year. Stoney did not return a call for this story. warrant against a woman for a 2009 citation issued for driving with an expired registration and no insurance. The woman provided proof of insurance but failed to pay for the expired registration and did not appear in court. In July 2010, the court contacted the woman to inform her of the delinquency. Later, the woman admitted to being rude with court staff during that conversation—even going so far as to describe police officers as “pricks,” according to complaint documents. Stoney apparently found out about the woman’s statements and, in a hearing, berated the woman for bullying his staff, according to complaint documents. After reviewing her file, Stoney issued a $10,000 warrant for her arrest—an amount the JCC found to be excessive for a moving violation. In August 2011, the JCC reprimanded Stoney. Stoney, in turn, appealed the decision to the Utah Supreme Court at a June 5, 2012, hearing, saying he had issued the warrant but believed the amount to be a mistake. According to JCC documents, Stoney claims the original warrant, which would have shown the amount, has been “either lost or misfiled.” The court is still deliberating on its ruling. While the JCC can neither confirm nor deny other investigations of misconduct against Stoney, documents from Stoney’s file regarding the excessive-warrant investigation indicate a JCC investigator named Susan Hunt had spoken with Stoney about other complaints, including those of Damron. In June 2011, Stoney sent an e-mail to the JCC complaining that the commission was not following its own rules in investigating complaints lodged against him by Hunt, and said that the investigation against him revolved around his courtroom demeanor. In that same e-mail, Hunt references multiple complaints filed against Stoney, including the Damron incident. Hunt says Stoney told her that, prior to the hearing during which he jailed Damron, he had a lunch meeting with court staff, the city prosecutor and Saratoga Springs Mayor Mia Love. According to Hunt’s e-mail, Stoney told her that Love had warned him that the Peltekians may try to record the court proceeding. By law, justice courts in Utah are not courts of record that keep audio records or court-reported notes of hearings. On July 12, Stoney may be the one to sit in the hot seat and explain why he jailed Damron for a crime that, according to an April 2011 ruling by Fourth District Judge Claudia Laycock, is not actually a criminal offense. That ruling precipitated Damron’s filing for the upcoming bench trial, where her attorneys will seek to clear the charge from her record. While the JCC would not comment on any possible investigation into Stoney, Edward Peltekian says he believes that if his family prevails against Stoney it could spell a public reprimand against his judicial record. If Stoney racks up two reprimands, both in the West Valley City complaint and the Damron case, it could mean he would be ineligible for retention in 2016. For Edward Peltekian, challenging Stoney’s authority in the courts could be the only way to stand up to a judge he believes has gone after his family with a vendetta.